N’zoth is just the core. It shares the core’s damage, health, and shielding. Trait – The Corruptor: Enemy Heroes who take damage from any of N’zoth’s abilities are given stacks of Corruption, stacking indefinitely. N’zoth can use the 1, 2, 3 and 4 keys to detonate his stacks of Corruption for different effects. These abilities all share a 3 second cooldown. In addition, every 2 Corruption used on enemy Heroes summons a Mindless One at their location. Mindless Ones attack nearby enemies (prioritizing Heroes) for 5 damage every second, cannot be attacked, and explode in a 3-radius area after 5 seconds for an additional 10 damage. Mindless Ones deal 100% more damage to non-Heroes. Mindless One attacks do not apply Corruption, but their explosions do. 1: Summon Servants: N’zoth sacrifices up to 10 corruption stacks on an enemy Hero. Each Corruption stack used gives vision of the enemy Hero and a radius of 2 around them for 2 seconds and summons a Mindless One. 3 second cooldown. 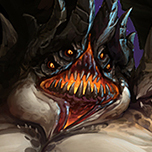 2: Whispers of the Deep: N’zoth consumes up to 20 corruption stacks on an enemy Hero, causing them to be silenced and rooted for .1 seconds for each Corruption used. Every 5 Corruption used summons a Mindless One. 3 second cooldown. 3: Tendril’s Grasp: N’zoth crushes the enemy hero with tendrils, dealing 1% of their maximum health in damage for every stack of Corruption used, up to 20. Every 4 Corruption used summons a Mindless One. 3 second cooldown. 4: Empower: The next use of Tendril’s Grasp, Whispers of the Deep, or Summon Servants has its Corruption cap increased to 50. 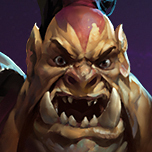 If 50 Corruption stacks are unavailable on the current Hero, Corruption will be used from other enemy Heroes. 90 second cooldown. W – Power of Darkness: Corrupt allied minions in a 6-unit wide area. Corrupted minions have their damage increased by 2% per second until killed and grant a stack of corruption when they attack enemy Heroes. Corrupted minions spawn a Mindless One when they die. This ability does not stack. (20 second cooldown). E – Enclosing Void: After 1 second, blanket an 18-unit diameter area with void energy that deals 20 damage every .25 seconds for 3.75 seconds. Every 3rd tick of damage on an enemy Hero grants a stack of corruption on that Hero. In addition, every tick reduces the diameter of Void Blast by 1 but increases its damage by 4. Void Blast’s final tick of damage applies 5 stacks of corruption, and the damage is quintupled if it hit at least 10 Heroes. (15 second cooldown). R – To Ny’alotha: Channel for 5 seconds. After the channel completes, all elements of the Battleground are placed into Time Stop (Structures, Objectives, Minions, etc.) and all Heroes are revived, have all cooldowns reset, given full Health and Mana, and teleported to Ny’Alotha. Ny’alotha is a 20 unit by 20-unit square, separate from the battleground. N’zoth is unable to use any abilities while To Ny’Alotha is in effect. After 10 seconds, all elements of the battleground unfreeze, and the status and position of all Heroes are reverted to the way they were at the end of the channel of To Ny’alotha. 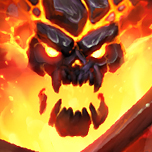 Any Enemy Heroes who died during To Ny’alotha instantly die. Any remaining enemy Heroes are given 5 corruption. (180 second cooldown). R – Servant of the Deep: Select a dead allied Hero. The Hero is revived after 3 seconds at the point of your mouse cursor, for the duration of the time remaining on their death timer. While revived in this manner, the Hero is unable to cast any of their normal abilities. Instead, the Hero has 7.5 attack range and attacks for 200 damage. Each basic attack applies a stack of corruption. They also gain the ability Cursed Wave on their Q key, which sends out a large arc of water in front of them that deals 400 damage and applies 1 stack of corruption, with a 3 second cooldown. The Hero cannot be killed during Servant of the Deep. Instead, every 50 damage taken reduces the damage dealt by the Servant of the Deep by 1%, up to 80%. When Servant of the Deep ends, the Hero’s death timer is reduced to half of what it when the ultimate was used. i like the idea personally of core heroes but i wonder why people are disliking this empty thread but not giving any ideas on how it could be better. Also the heroics seem too strong imo. For one thing, I don't see anything that lets you kill N'Zoth. I get that he's the Core, so if he dies his team loses, but the fact that he'll never be stuck waiting for respawn, and will never give XP to the enemy, is a very significant advantage. For another thing, Blues have said in the past that they wanna be careful with how they use summons, because they can create visual clutter and negatively impact performance (of the system running the game). I also agree that the heroics are too strong.